If you don't know who Betty white is, you're not from this planet, are you? She's the ruler of the world of comedy. 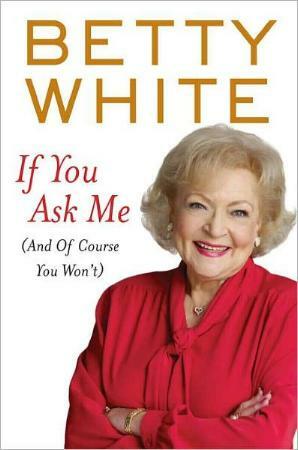 This is not Betty's first book, and this time around she imparts many a pearl of wisdom. She talks about her own life but also touches on health, humor, Hollywood stories, getting old, her work (and work in general) as an actress, love, animals, and more. Who knew Ms. White was such a crossword fan? Her take on aging is rather philosophical and upbeat, as it should be, there's no avoiding it. Her anecdotes from some of her shows or the people she's met or worked with are hilarious. And having been at it for 63 years, there's lots to tell! Her television work is legendary (Golden Girls, The Mary Tyler Moore Show, Hot in Cleveland), and her many movies are must-sees. One of my favorite movies (not just because Betty White is in it, and she's wonderful) and which I watch at least four times a year, is The Proposal. Her book is predominantly this time in her career, and what a blast this phenomenal woman is having. I'd give my eye teeth to spend a day with her, or on a trip to the L.A. zoo with her. What fun! Ms. White had a wonderful marriage, long and loving. And yes, she does talk about hosting Saturday Night Live. I'm with Betty White on animals being her preferred company to humans. Obviously not all the time, but you know what we mean. I cried at the Koko story—how I'd loved to have also been there. And, strangely and scarily enough, we both love writing tablets and packs of typing paper. Eerie! Conclusion - One truly funny, decent, caring human being. She's a lesson for us all.